Desired and reviled, adulated and condemned, Winnipeg inspires intense and contradictory emotions from residents, visitors and people who have never even ventured within wading distance of the Manitoba capital. The city at the centre of North America inspires a profound sense of ambivalence, stuck as it is between a colourful and triumphant early history, a long period of 20th-Century decline and an uncertain if optimistic future. Stuck in the Middle finds photographer Bryan Scott and journalist Bartley Kives exploring the geography, design and reputation of the only city they have ever truly known, loved and hated. With vicious honesty and intense affection, Scott and Kives expose Winnipeg's beautiful and conflicted soul for the rest of the world to admire and detest and ultimately ignore. Check out some of the press to date on Stuck in the Middle. Click here for print, TV and radio coverage. 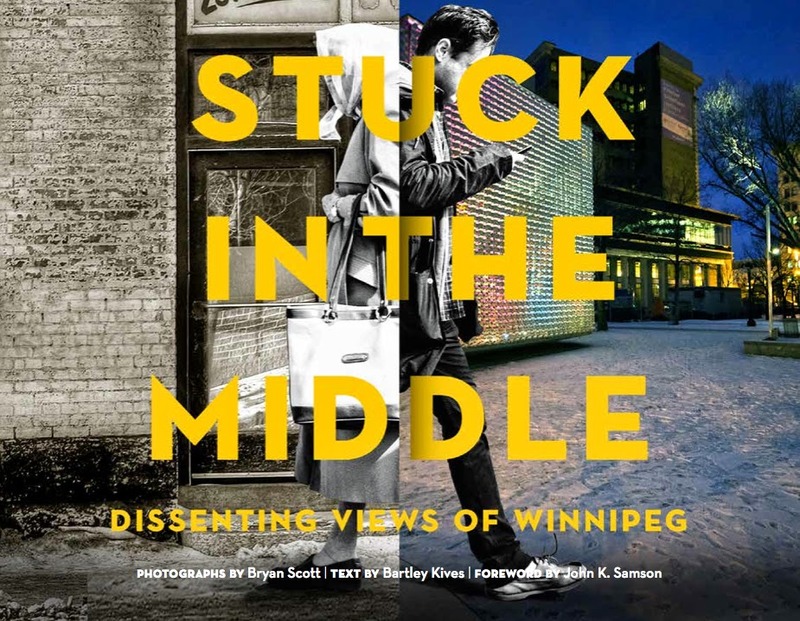 Winnipeg photographer Bryan Scott has been documenting the city’s architecture and streetscapes since 2005. After studying film, architecture and graphic design, he works in advertising while maintaining the photo blog Winnipeg Love Hate. He self-published a book of photos from the site in 2010. Journalist and author Bartley Kives has been writing about urban affairs, pop culture, travel and sustainability in Winnipeg since the 1990s. He is reporter-at-large for the Winnipeg Free Press and an occasional broadcaster. His first book, A Daytripper’s Guide to Manitoba, was published in 2006. It has since become a Canadian bestseller. Published by Great Plains Publications. Cover and design by Relish Design Studio Ltd.